CitriSurf® Brass/Bronze Cleaner is a citric acid based formula that safely and effectively cleans and removes tarnish from brass and bronze as well as copper. It is an easy to use spray on and rinse off product. Clean the surface of any dirt and allow to dry if necessary. Completely wet the surface by spraying, wiping on or immersing in CitriSurf Brass/Bronze Cleaner. Respray or wipe as needed to maintain a wet surface. Allow the surface to soak until the tarnish is removed, usually about 5 minutes. After soaking, rinse the surface thoroughly with clean water and allow to completely air dry. Drying can be accelerated by use of a hot air blower like a hair dryer, or with a clean cloth. Repeat process if necessary to obtain desired results. If the brass or bronze has a lacquer coating, this will need to be removed prior to treating with the CitriSurf Brass/Bronze Cleaner. Lacquer thinner can be used for removing this coating. If you are unsure if the metal has a lacquer coating, try using the CitriSurf Brass/Bronze Cleaner to remove the tarnish. If the tarnish does not come off, then there is likely a coating that needs to be removed. 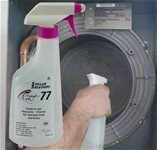 CitriSurf Brass/Bronze Cleaner is a package consisting of CitriSurf 77 and special instructions for use cleaning brass and bronze. The Bronze hand plane shown in the product photo above is for illustration purposes only and is not included in the package. A. Yes. This is the same product. 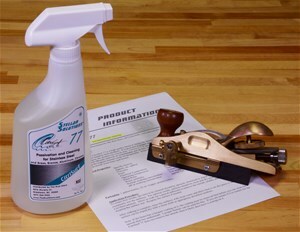 CitriSurf 77 has been found to be an effective cleaner for brass and bronze as well. When purchased in the Brass/Bronze package, it comes with specific instructions for that use. A. Yes. It is also effective for Removing Limescale and Cleaning Boilers and Heat Exchangers. A. CitriSurf will cause damage to the surfaces of concrete, carbon steel, zinc, and galvanized steel. Avoid exposure of these materials to CitriSurf and rinse immediately if there is an inadvertent spill onto these materials.